Feb 28, 2018 › Categories: Got Beer? Who else could use a vacation? Preferably somewhere warm and tropical, where you don’t have to negotiate tough trade agreements and the relic hunters are actually hot con artists… Wait, where have I seen this before? Anyone who knows me knows that I’m not just a beer nerd, so when I discovered that Schmaltz brewing had created a beer called Captain’s Holiday in honor of an episode of “Star Trek: The Next Generation,” I knew I had to try it. As I was also suckered in by the Monty Python beer and the Game of Thrones beer, I knew I would have to buy it and try it. 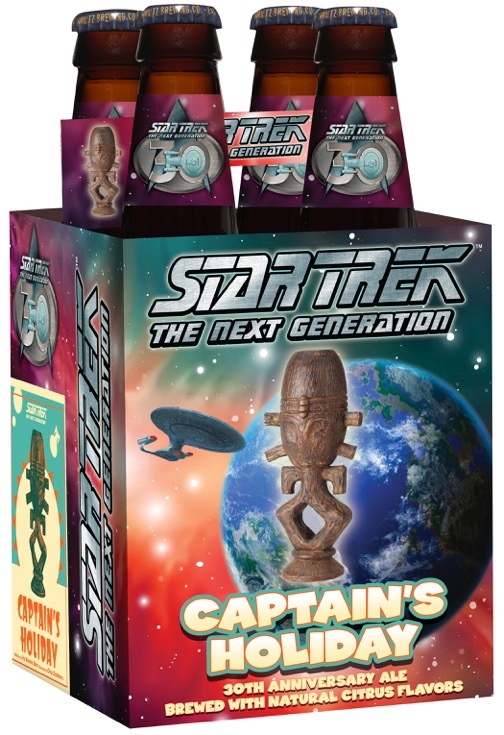 The label features the Horga’hn statue featured in the episode, which is symbol of, urm… I’ll tell you when you’re older. For those unfamiliar with “Star Trek: TNG,” it was a surprisingly well-written science fiction powerhouse that spawned two spinoff shows and revitalized a franchise long considered dead. It had unique, likeable characters, and despite a few episodes that were Cheez Whiz grade silly, remained a solid series up until the end. But we’re not talking about that today. We’re talking about a beer named in honor of one of the slightly cheesier episodes, but one that’s still enjoyable to watch: “Captain’s Holiday.” In it, the Captain needs a vacation, and takes it on a renowned pleasure planet, but not for the reasons the rest of us would. He stumbles into some intrigue with a con artist, a smuggler and two irritating aliens from the future all after an artifact of great power. Well, what do YOU do on your vacation? Sit on a beach and drink? The beer boasts something that usually gives me chills: “natural flavor added.” That usually means extracts of something-or-other, but Schmaltz is a legit operation, so I’m cautiously optimistic. It’s light, citrusy and much tastier than it should be. It brings to mind tropical climates, which is nice, because as I try this beer it’s bloody snowing outside. It’s wonderfully bright, but not without some fruity complexity from the interplay of the hops and what I can only assume is some lime or lemon juice. 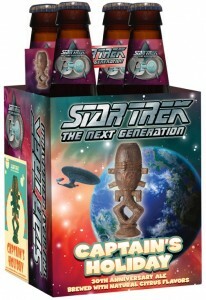 I would certainly be willing to enjoy this brew while brushing off rude Ferengi smugglers. Had this beer been made by a less talented brewery, it would likely have been some sort of shandy, but there was definitely some clear thought and consideration put into this recipe. I respect that. It’s citrusy in all the right ways, making the “natural flavors added” tag a lot less intimidating. I’d dial back the neutrino field a little, but otherwise, a solid concoction. It’s recommended by 4 out of 5 spandex-clad ship counselors for relieving stress after a tense stand-off with some prissy Romulans. This is one refreshingly citrusy brew, definitely suitable for sitting by the pool in warm weather somewhere. Since I’m housebound for a while, could anyone heading in the vicinity of Risa pick me up a Horga’hn?